Ronnie Perna was up early on Sunday and quickly out the door with her dog, Termite, for the most important walk they would take all year. 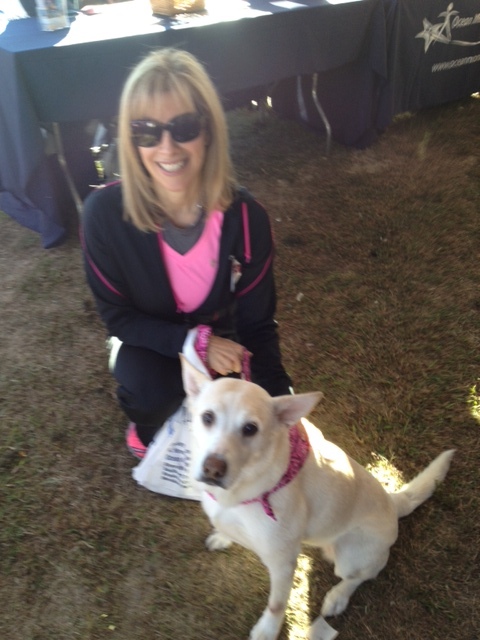 They joined more than 20,000 other walkers for this year’s Making Strides of Point Pleasant Beach. Together they raised $1.3 million for breast cancer patients and research. “It was very moving seeing all those people who are survivors and the people who support them,” said Ronnie, who is among the survivors. Eight years ago, Ronnie was diagnosed with breast cancer following a routine mammogram. She had no family history of cancer and she had been feeling fine. “If it hadn’t been for that mammogram, I wouldn’t have known,” said Ronnie who was running a retail shop at the time. It was a frightening time for her and her only daughter, Amanda, who was then a young adult, but Ronnie got the care she needed. For Ronnie, Making Strides is an opportunity to raise awareness so other women can get the care they need as well. That should start, she says, with an annual mammogram. Amanda was so affected by her mother’s illness that she switched careers to become involved in women’s health care. She now works with ella health raising awareness about the importance of mammograms. “What we do every day is about educating women and saving their lives so they can be around for their children and their grandchildren,” she said.